Reusing metadata generated through years of cataloging practice is a natural and pragmatic way of leveraging an institution’s investment in describing its resources. Using Library of Congress Subject Headings (LCSH), the Biodiversity Heritage Library generates new interfaces for browsing and navigating books in a digital library. LCSH are grouped into tag clouds and plotted on interactive maps using methods available within the Google Maps Application Programming Interface (API). Code examples are included, and issues related to these interfaces and the underlying LCSH data are examined. 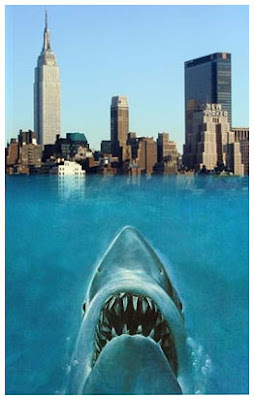 Or, What the heck are Great white sharks doing in the vicinity of New York City?? Since I'm the tech lead for the Biodiversity Heritage Library, I get to review a good sampling of our digitized content as I'm testing out new functionality. It never fails to amaze me the interesting things I stumble across, and yesterday's discovery was no different. "Fishes of the vicinity of New York city"
Great white shark + Fishes of the vicinity of New York city = Yikes!! 14. Carcharodon carcharias (Linn.) White Shark. "Man-eater." Accidental in summer. June to July 14, 1916. The book was published in 1918, and here the author, John Nichols, is documenting an occurrence of a Great white shark - a "Man-eater" - in the New York area during the summer of 1916. It wasn't until I glanced over the content that it clicked - this is the true story that inspired Jaws. Jaws!! I was born a month after it came out, so I literally grew up in the wake of that film and its impact on popular culture. It defined the summer blockbuster, made a star out of Steven Spielberg, and yet also did something not so good - it further perpetuated the myth of the Great white shark as a merciless killer...a myth that grew into legend with the real life occurrence of a Great white shark in the vicinity of New York city in the summer of 1916; an event that was documented in Nichol's book. As I read through the article in more detail I realized there were several mentions of Nichols giving his professional opinion, as an ichthyologist from the nearby American Museum of Natural History, about this rare and unusual (and unfortunately deadly) occurrence. Being a WikiCitizen, I wanted to put my knowledge of this digitized book into the Wikipedia article since it documents this sensational event within a scholarly publication. I added the title to "Further Reading" and updated the "Revising science" section to include a reference to Nichols' documentation of the occurrence. Within 2 hours my addition had been further refined. You can see that another WikiCitizen and I are wrangling over some phrasing, but regardless, I've made my contribution. I've helped - hurrah! My point here is not to keep perpetuating the myth of the Great white shark as a "Man-eater," because hopefully by now that myth has been debunked and everyone knows that Great white sharks are just perfectly streamlined predators at the top of their game - if you put up a cage in my natural habitat, led me to it with food, then poked me with a stick I might try to bite your arm off, too. No, my point is to illustrate but one of many events where science and pop culture overlap, and how efforts like the Biodiversity Heritage Library can help illuminate them. This factual event was widely reported in the popular press and was a big sensational story of its time. It also made its way into scholarly publications, like Nichols' biological survey. Using tools we've developed for BHL, I was able to identify some unusual results in the discovered bibliography for Carcharodon carcharias that made me connect stories I'd heard before in a new way and motivated me to learn more on a particular topic. Further, observing this unusual result got me to contribute this tiny, tiny bit of information to the wider universe of knowledge that is Wikipedia and the greater internet. And that, I think, is really, really cool. An aside: Once the Encyclopedia of Life allows user contributions, I'll be sure to muss up that page as well with this tiny, tiny bit of information. By the way, it's great to see our bibliography in EOL, including the Nichols reference! Another aside: That text was copied directly from the OCR text, showing that in some cases the OCR can be quite good for historic materials (this book was published by the American Museum of Natural History in 1918).